We’ve been looking at Einstein’s special theory of relativity this week. Special relativity is tricky get get your head round. Let’s start with a video about the speed of light. We watched this video in class, it follows Einstein’s thought process as he worked through his special theory of relativity. special relativity from mr mackenzie on Vimeo.We need to consider two aspects of special relativity, time dilation and length contraction. We’ll look at time dilation first. A Tale of Two Twins from Oliver Luo on Vimeo. This video has helpful examples to explain length contraction. Sometimes it’s easier to imagine we’re a stationary observer watching a fast moving object go whizzing past. For other situations, it’s better to put yourself into the same frame of reference as the moving object, so that everything else appears to be moving quickly, while you sit still. The muon example in this video shows how an alternative perspective can work to our advantage in special relativity. Another way to think about this alternative frame of reference is that it’s hard to measure distances when you yourself are moving really quickly. Think about it, you’d get tangled up in your measuring tape like an Andrex puppy. It would be far easier to imagine you’re the one sitting still and all the objects are moving relative to your position, as if your train is stationary and it’s everything outside that’s moving. That keeps everything nice and tidy – including your measuring tape. Got to love Einstein’s postulates of special relativity. 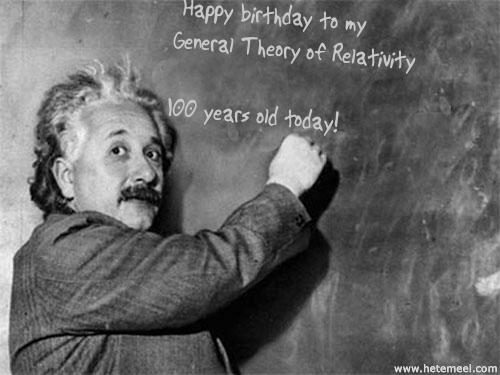 It seems general relativity is 100 years old today. We’ve been struggling a bit with this topic, so I thought these videos might help. Why Einstein is such a big deal from Fusion Media Network on Vimeo. General relativity explained in under 3 minutes from Fusion Media Network on Vimeo. Science Museum – Einstein’s Cosmos from ORDER Productions on Vimeo. #Einstein100 – General Relativity from Eoin Duffy on Vimeo.